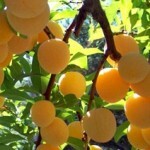 The gage plums are among the most tasty of all fruit for dessert and preserving. Best known is the old Greengage, ripe in late August, and still holding its own with modern varieties. Culture is explained under PLUM.